Troi- check your body language! You’re better than that! The Enterprise encounters some two-dimensional life forms and during the encounter, Troi somehow loses her empathic abilities. As she struggles to come to terms with this loss, the crew of the Enterprise seeks to escape from the creatures’ hold on the ship as they are brought into peril. The crew figures out a way to escape the clutches of the 2D creatures and after escaping, Troi’s abilities are restored. It was very interesting to see Troi have to deal with the loss of her abilities and come to the realization of how much she relied on them–yet could succeed without them. It was a great way to introduce some major character development for Troi. In particular, her realization that she could be a successful counselor apart from her abilities lends her character insight going forward in a believable fashion. The problem with “The Loss” is the major pacing issues that crop up throughout the episode. It just doesn’t move very quickly. The interactions with Troi are compelling and really the only thing that held my attention throughout. The use of the 2D creatures seemed simply unimportant. It would have been better if the episode had simply focused more on Troi and her difficulties overcoming grief that came with the loss of her empathic abilities. She delivers a stirring performance and traces the “5 stages of grief” in an engaging fashion, but any scene without her basically became background noise against the drama of her character’s struggle. A good episode with (finally) some development for Troi’s character. I just wish it had done more with it. *This one is out-of-sequence because the discs were packaged 1-2-4-3-etc. instead of 1-2-3-4. Blame the manufacturer and enjoy this review anyway! A previously un-encountered being is accidentally killed by the Enterprise when it acts aggressively. However, it turns out the being was pregnant and the Enterprise works to save the child. It imprints upon the Enterprise and the crew must hurry to get it to seek after its own kind. Meanwhile, Dr. Brahm–previously encountered only on the holodeck in “Booby Trap,” is on board and Geordi La Forge struggles to reconcile his concept of her with his experience of her holodeck persona. Ultimately, the two must work together to save the ship. They succeed, leading to their ultimate reconciliation and friendship. Look! An episode about Geordi’s ineptitude regarding women! We haven’t seen this before! Oh wait. Seriously though, “Galaxy’s Child” is an entertaining episode all-around. The discomfort La Forge suffers with his encounter with Dr. Brahm provides an intriguing look into how we view reality through lenses. La Forge’s lenses seem to be clouded by his connection with a holodeck imitation of the real thing. When he founds out she’s married, his interactions afterwards with Guinan are good too. It’s not the worst portrayal of broken hearts in the series so far. The plot with the “child” is also interesting, but ultimately does not carry as well as it may have. The delight that Picard and Riker displayed upon realizing they’d never encountered such a being before was so in-character and superbly done! Picard’s distress over killing it was also spot-on. This week had two episodes carried by characters outside the usual suspects. It was an uneven ride, but ultimately a good one. TNG continues to thrive on its superb characterization. Many people I know have been discussing the notion of raising minimum wage and whether they agree/support or disagree/don’t support such a notion. A friend shared an image of President Obama on the left on Facebook and I thought I respond. I do not claim ownership of the image (which was posted by the “ATTN” group and I use with fair use), nor did I check to verify the quote’s accuracy. However, I thought it was worth responding to, as a general type of argument for raising minimum wage, so I typed up a bit of a response here. Second, the question is whether positions offering minimum wage are even intended for those who wish to “work full-time and support a family.” Frankly, the vast majority of those positions which do offer minimum wage are entry level positions, often with possibility of promotion. These positions are very often used as just that–college students just trying to make some money to burn on music or nights out with friends. 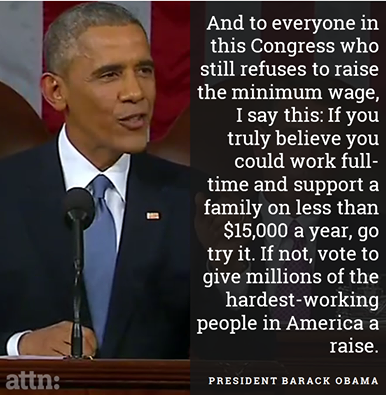 The objection is then raised: “But there are people who are trying to live on full time minimum wage with a family!” Well yes, that’s why I said this is such a complex issue, but to just blanket the whole thing by saying “Let’s just raise minimum wage, if you don’t like it, go try it yourself!” is obfuscation at best. Obviously this would not be a helpful stance and it clearly ignores a number of truly relevant and important points that those who are for raising minimum wage are raising. That’s the problem with pithy statements. I’m not saying any of this to be unsympathetic, but I do think the realities of economics are too often ignored in these conversations. Should we work to try to end economic inequality? Of course. But in doing so we should not overly simplify the issues, because when we do, no real solutions are offered, and those solutions which are offered cannot take into account the complexity of the issue (because we’ve ignored it). Sorry for the wall of text, but I wanted to explain some of the issues I see from the “other side.” As for my own position, I’m about in the middle because I think it is far more complex than people on either side are presenting it. I’d love to know what you think! Let me know in the comments. I’ll admit it, I’m going to miss you Wesley! Riker’s in trouble. He is poisoned by some kind of gas and awakens… apparently sixteen years later with memory loss. But something just feels wrong to Riker, and he figures it out when his wife is alleged to be someone who only existed on the holodeck. It turns out the Romulans have been toying with his mind on a holodeck. However, that is only another layer, because even that scenario turns out to be mistaken. Riker puts his foot down and it is finally revealed a lonely alien has kidnapped him and tried to keep him there. Riker reprimands the alien, but then the two depart, giving the alien a chance to find a new home with other people. It is unfortunate that the ending of “Future Imperfect” is so much of a cop-out, because the plot is extremely interesting. Riker’s continually confronted by alternative accounts of how he got into his predicament. Initially, it seems entirely plausible that it is a Romulan attempt to get information out of Riker, but as the episode continues, Riker continues to peel back layers of the onion. The episode is ingenious in the way it draws viewers along the same logical path as Riker: we realize not all is as it appears and are suspicious of the Romulans, then we realize the kid has shown up in a few different places and his story is inconsistent, then we start to suspect the kid is the one doing all of it. The way this is built up is interesting and keeps the plot moving in such a way that it has viewers on the edge of their seats. The problem is that the ending is such a clear case of “How do we tie this up in a minute” that it just undermines the whole feel of the plot. The mystery builds up so much and then it just falls into being just another godlike-scenario kind of cop-out. “Future Imperfect” is probably better than the grade I gave it–it is one of the most compelling plots we’ve run into in some time–but the ending is just too much of a let-down for me. It went from what could have been an all-time greatest episode to being merely good. Wesley, Picard, and a “captain” of a shuttle are stranded on a desert planet and have to get to water that is behind a force field. With Picard injured and the captain in stasis, Wesley must save the day [again]. Meanwhile, the Enterprise has to tow a garbage ship away from a local planet to prevent them from suffering immensely from radiation poisoning. 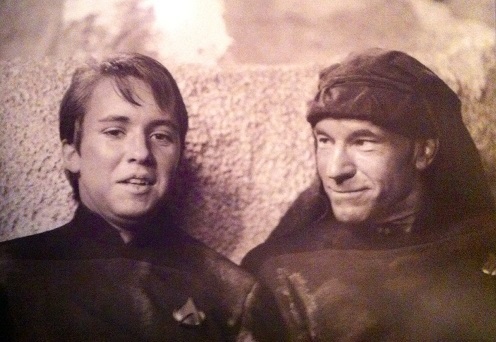 The Enterprise and Wesley both succeed. High fives all around. “Final Mission” could have been much better. The entire episode really just felt like a way to throw Wesley and Picard back together so we can see them sharing some genuine moments together. I mean the “main” plot really just is as follows: Picard, Wesley, and random captain of a shuttle get stranded on a dry planet. They find a source of water that is defended by an energy being and must get the water. Sure, there’s a few wrinkles added to this, but wow that is a seriously thin plot. The secondary plot features the crew of the Enterprise working to get a garbage vessel away from a planet it is threatening with its radioactive waste. It’s an interesting premise but it doesn’t have enough going on to keep the tension that an episode needs to keep up. What the episode does do well is the genuine moments mentioned above. Picard and Wesley interacting has become a theme and the growth of their relationship over the course of the series, and if I recall correctly this might be his final episode as part of the crew due to his going to Starfleet Academy. It’s a good way to wrap up a character who has never been my favorite. But really, at this point, I have to say the continuity of Wesley’s story has made him more interesting. I don’t remember, but I hope he shows up again to give us at least a few insights into where he has gone. Well it’s time for the NFL Conference Championship round! Who’s going to win? Here are my picks (I was 3-1 last week in divisional round; picked Denver over Indy). As much as I dislike the Patriots, I think they have a very scary team, as usual. I would not want to play them right now, but the Colts get the draw and they have to visit the Patriots. I don’t think the Patriots get a huge home field advantage like some other teams have (see below), but I do think they have the Brady advantage. He’s just too good. I predict a costly turnover changes the game and turns it into a bit of a rout. 34-17 Patriots. I’m once again going with the Seahawks here. I made the mistake of picking against them last year and that was a terrible choice. I’ve learned my lesson. A stifling defense and a top 10 offense playing in one of the loudest stadiums against a hobbled Aaron Rodgers? It’s honestly still tough because Rodgers is that good but I’m going with my gut and the Seahawks. If the Packers win it will be on the strength of Rodgers’ arm. But what I really think will happen is that a stiff Seahawks defense stands tall at the end of the game halting the Packers’ last drive in some dramatic fashion. Anyway, I call it being 24-17 Seahawks. Do you think I’m crazy? What if I’m right? Let me know your picks and thoughts in the comments below. The main guy on the cover (with lightning fingers) occupies about 10 pages of the book. Weird. I have embarked on a quest to read through the Star Wars Expanded Universe once more. Be sure to check the linked text there to see other posts in this series. 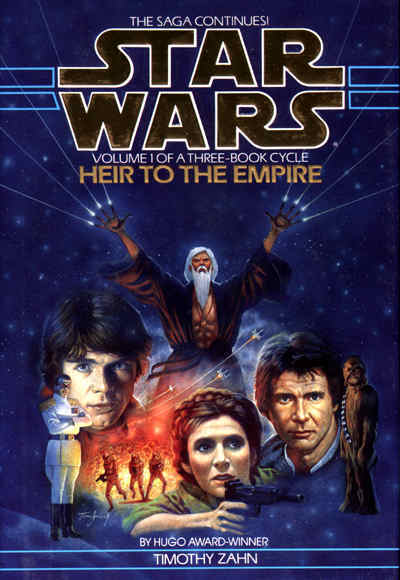 Here, I look at Heir to the Empire by Timothy Zahn. Well, here it is folks, the beloved Thrawn trilogy. I remember vividly checking this book out of the library some 17 years ago or so and then absolutely devouring it. But that was a long time ago. Does it hold up now? Timothy Zahn has gone down as possibly the best Star Wars writer for a reason. His understanding and portrayal of the characters is so true-to-form, and the characters he introduces are impactful rather than being window dressing as they seem in some other books in the EU. The plot is interesting as well. We’re a few years out from the destruction of the second Death Star and the Empire is largely on the ropes. But a Grand Admiral who had been out in the boonies has gotten control now and his tactical insight is turning the war around, at least on the outside. Meanwhile, political intrigue among the leadership of the Rebellion (now the “New Republic”) threatens to spill over. All of this is not to mention some interesting stories regarding a woman–Mara Jade–with an intense hatred for Luke Skywalker and dealings with smugglers. Zahn does a fantastic job balancing the new characters with those we know from the movies, and his writing style constantly keeps the action and plot moving. There’s just enough balance between action and backstory to keep it moving. At some points, the plot points are a bit too convenient. For example, it seems altogether astounding that Thrawn, Han and Lando, and Luke would all happen to get thrown together before Talon Karrde at his “secret” base. Granted, Zahn introduces reasons for them all to be there, but it seems just a trifle contrived. Overall though, this book has its status as hallowed Star Wars lore for a reason. It’s just fantastic. It’s a thrillride that doesn’t disappoint, and I’m happy to re-read it. On with the rest of the trilogy! C-3PO impersonating Princess Leia. What more needs to be said? Heir to the Empire is just fantastic. It holds up well after all this time. The balance of characters old and new is perfect, and Zahn’s writing is well-suited to the Star Wars universe. A truly superb book. Here I offer my picks, score predictions, and brief commentary. I’m fairly sure I’ll be wrong on all of these, but here goes! Tom Brady at home with a great defense to help him? Sorry Ravens, I want you to win but I pick the Patriots to win this one 24-13. Flacco will finally throw a pick or two and that’ll be enough to win in what will be a fairly close-feeling game throughout. Patriots in control the whole game. As hilarious as it’d be to see a 7-8-1 team in the Conference championship game, I just don’t see this happening. I also made the error of picking against the Seahawks in the Super Bowl last year, something that still haunts me. I’m not making that mistake again, and definitely not against a team with a losing record. Seahawks win this with a solid defense effort and enough of a ground-and-pound game to score. 20-10 Seahawks. Romo is on fire right now and he’s leading a fantastic offense with tons of weapons. Here’s the problem: Aaron Rodgers is on the other team. I really want the Cowboys to win but I don’t think it’s gonna happen. This is the one I feel least confident about, but I’m gonna pick the Packers at home winning in a shootout 31-28. Peyton Manning gets another shot at the Conference Championship and the Brady-Manning rematch is on. I expect this to be another close one but I think the Colts have a few deficiencies on their team–like running the ball and rushing the QB–that will sink them in this one. Broncos win 35-24. Let me know who’s going to win and how wrong I am on scores and picks in the comments! A Federation vessel sends a distress call from Turkana IV, birthplace of Tasha Yar. The Enterprise goes to investigate, discovering the crew has been captured by a faction on the planet. When an away team beams down, they further discover that Tasha Yar had a sister, Ishara, who is deeply entrenched in one of the factions. Picard and crew–particularly Data, interact with Ishara throughout the episode, learning more about her and Tasha (and finding many parallels) in the process. They also plan a rescue of the captured Federation personnel. After taking out a tracking device in Ishara used by the factions to keep balance, Ishara uses the rescue mission to try to bring down the security system of the rival faction. She is discovered by Data, whom she threatens to kill before he manages to stun her and halt disabling of the system. Ishara is beamed back to Turkana IV after a brief discussion with various crew members. Whew that was a long summary. The episode has a lot going on, but to the writer’s credit, it never feels disjointed or too convoluted. You knew you were going to run into something related to Tasha when the planet was announced, but to find a sister was an interesting twist. Moreover, the best part of the episode was seeing how Ishara manipulated the crew, who had the best intentions but each projected their own desires onto Ishara. It serves up a great commentary on human nature and the way we often do try to see things the way we want them to be rather than as the way they are. Data’s parting line to Ishara is epic. After a heartfelt mini-speech from her about how she felt Data could be a friend, he just says “Energize.” Data has no time for betrayal! His brief conversation with Riker afterwards adds to the interest of his character in the episode. “Reunion” was another episode that had a ton of plot points happening. Many more are summarized here. K’Ehleyr’s line to Gowron- “You talk like a Ferengi!” Oh my goodness that was an epic line. But the epic lines weren’t all that went right in this episode. The entire plot was phenomenal, as we got to experience more of Klingon culture with the right to lead the Klingon High Council up for grabs. Worf hunting down Duros after he assassinates K’Ehleyr and fighting him to the death is a fitting end for the traitor. It was also surprising becuase I definitely thought that someone would stop him in the act. Having Picard issue an official reprimand was totally in character as well. 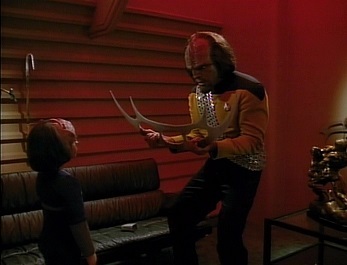 The addition of Alexander–Worf’s son–to the cast, I know, has implications later, but for now it was a unique device that ties Worf more intricately into a broader storyline of his own development riding the line between civilizations. I would also be remiss not to mention the introduction of the Bat’leth–the Klingon weapon (seen in picture)–and the cultural background of the Klingon Empire added into this episode. It’s just awesome. So much happens in this episode that is awesome. It’s hard to even try to list everything. There is also enough ambiguity to keep viewers absolutely enthralled waiting for the next plot entry. Sure, Duros is dead, but what will happen with the Klingon Empire now that it is lead by someone willing to resort to bribery (and who really did work with the Romulans)?